Investigation of the functional architecture of the human brain using modern noninvasive imaging techniques is a rapidly expanding area of research. A proper knowledge of methodology is needed to appreciate the burgeoning literature in the field. This timely publication provides an excellent catalogue of the main techniques. The authors offer an invaluable analysis of mapping strategies and techniques, providing everything from the foundations to the major pitfalls and practical applications of the modern techniques used in neuroimaging. Contains over 1000 full color pages with more than 200 color figures. 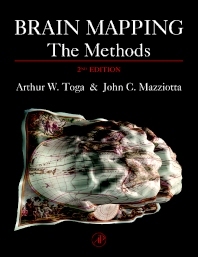 Spanning the methodological gamut from the molecular level to the whole brain while discussing anatomy, physiology, and pathology, as well as their integration, Brain Mapping: The Methods, Second Edition, brings the reader a comprehensive, well-illustrated and entirely readable description of the methods for brain mapping. Drs. Toga and Mazziotta provide everything from the foundations to the major pitfalls and practical applications of the technique by assembling an impressive group of experts, all widely known in their field, who contribute an outstanding set of chapters. Dr. Mazziotta is a Professor of Neurology, Radiological Sciences, and Pharmacology and the Pierson Lovelace Investigator at UCLA, as well as the Director of the UCLA Brain Mapping Program that he established in 1993. Dr. Mazziotta has published more than 190 research papers and five texts and has received numerous honor and achievement awards including the Oldendorf Award of the American Society of Neuroimaging, the S. Weir Mitchell Award of the American Academy of Neurology, and the Von Hevesy Prize from the International Society of Nuclear Medicine. Dr. Mazziotta has been chair of the Scientific Issues and Program Committee of the American Academy of Neurology. He is the President-Elect of the American Neuroimaging Society and is the President of the Brain Mapping Medical Research Organization. He is also Co-Editor-in-Chief of NeuroImage.